The LDAP Search Base DN for the database. For example: dc=mydom,dc=com. The URL of the LDAP server including the port number. For example, ldap://ldap.mydom.com:389 or ldaps://ldap.mydom.com:636. LDAP authentication requires that you use either LDAP over SSL (ldaps) or Transport Layer Security (TLS) to secure the connection to the LDAP server. If you use TLS, click Download CA Certificate and enter the URL from which to download the CA certificate that provides the basis for authentication within the domain. Select either LDAP password or Kerberos password for authentication. 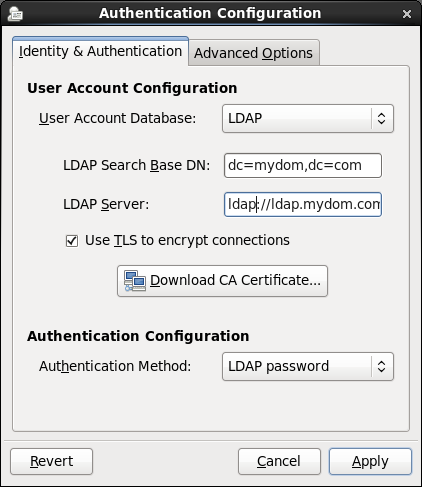 Figure 23.3 shows the Authentication Configuration GUI with LDAP selected for the user account database and for authentication. You can also enable LDAP by using the authconfig command. To use LDAP as the authentication source, specify the --enableldapauth option together with the full LDAP server URL including the port number and the LDAP Search Base DN, as shown in the following example:. The --enableldap option configures /etc/nsswitch.conf to enable the system to use LDAP and SSSD for information services. The --enableldapauth option enables LDAP authentication by modifying the PAM configuration files in /etc/pam.d to use the pam_ldap.so module. For more information, see the authconfig(8), pam_ldap(5), and nsswitch.conf(5) manual pages. For information about using Kerberos authentication with LDAP, see Section 23.6.3, “Enabling Kerberos Authentication”. You must also configure SSSD to be able to access information in LDAP. See Section 23.4.10.1, “Configuring an LDAP Client to use SSSD”. If your client uses automount maps stored in LDAP, you must configure autofs to work with LDAP. See Section 23.4.10.2, “Configuring an LDAP Client to Use Automount Maps”.